When I was at the grocery store I noticed that they still had a lot of cheap pineapples and I remembered that I had recently come across a recipe for a Thai pineapple fried rice in my bookmarks that sounded really good. I had not thought of adding sweet, juicy and tangy pineapple to a fried rice dish but the idea immediately stuck in my mind. I also noticed that the recipe called for a healthy dose of curry powder and combo’d with the pineapple it kind of reminded me of the curried pineapple banana bread that I had recently made and really enjoyed. I was already sold on the dish and the shrimp, cashews and raisins just took it over the edge! I only made a few changes including using brown rice and fresh peas since I had already picked some up at the farmers market. Whenever I make stir-fries, I clean, slice, chop and make sure that I have everything ready and on hand before turning the heat on as things move quickly after you start. The Thai pineapple rice was pretty easy to make after the prep work was done and the results were fantastic. The finished dish was so vibrantly colourful and the curry gave it an amazing aroma. The juicy pineapple and succulent shrimp worked really well with the curry flavours in this fried rice. The curry and chilies added the perfect amount of heat that was balanced by the pineapple and the raisins while the cashews added a nice contrasting texture. I have been raving about how good this fried rice was since I made it. I have a feeling that this dish will enter my regular rotation and given that you could easily use canned pineapple you could easily make this dish year round. You could also easily make a vegetarian version by omitting the shrimp and making a few ingredient swaps. Add the shallots, garlic, chillies and red pepper and stir-fry until fragrant, about a minute. Add the egg and stir-fry for a minute. Add the chicken stock, fish sauce, curry powder and sugar and stir-fry. Add the cashews and stir-fry for 30 seconds. Add the pineapple, shrimp, peas and raisins and stir-fry to mix them in. Remove from heat and serve garnished with chopped green onions and cilantro. 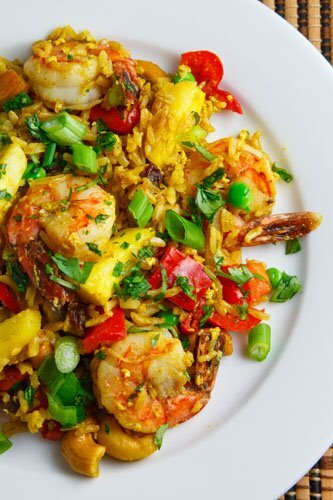 Love this rice dish…with all the flavors that you have in it. Pineapple and shrimps…yummie. I haven't had very good luck with making Thai inspired dishes at home, but this one makes me want to try again! Oh! I had totally forgotten to try making this dish! Sprinkle a handful of fried shallots over and this will make it even more complete! In some Thai restaurants, they will plate this fried rice in the empty pineapple halves! This looks delicious — but I'm not a shrimp fan. I wonder if you think it might work with chicken instead? That looks BETTER than any restaurant or take out! YUMMY!! ooh wow – I've always been wanting to fry some of this on my own after savouring it at various street stalls and Thai restaurants in KL. Your recipe looks real good – I'll make some and post it on my blog once i'm done. I remember having something similar once. I love the colors on that plate. It's like a party! This looks so delicious- pineapple sounds perfect in this dish! A wonderful flavor combo! That fried rice looks so luscious! This is the second time I came across this recipe…I was wanting to make it because it looks tasty and delicious…If I encounter this for the third time, I'll surely be making it right away..
Kevin, you pushing just the right buttons here to get me inspired for cooking. The rice looks absolutely delicious. I can taste it as I am typing this!!! I have never tried fried rice pineapple but it must be great! This looks really good. I love traditional fried rice, and this looks like a tasty alternative! i'd love to see a list of your "regular rotation" ~ everything is so amazing looking that i'm curious which ones make it to the top for you..
What a colourful looking dish! I'm craving for this now! This has so many good flavors in it! And colors, it's pretty AND delicious. Wow Kevin the colors in the dish are beautiful! I've been wanting to make fried rice for a while now. And when I do I shall use pineapple!! Yum! Kevin… that's one of the closest & authentic Khao Pad Sapparod! For me without that 'curry powder' it's not authentic 😛 I don't know which type of curry powder you use… in my family we use Waltrose's Madras Curry Powder or any brand of your choice if you want to hit the note. The curry powder brings out the dull color or else plain looking pineapple fried rice and added that special fragrance to the dish! I don't know why most Thai recipe books didn't mentioned and Thai Restaurants added this 'special powder' 😛 In my maternal Thai family, we added that 'curry powder' as long as we remember. Sounds so interesting, and I love fried rice! The colours are beautiful! Looks much better than my local take-away! Just in time – pineapples are on sale this week! This looks and sounds divine! I love the sweet and tangy flavor. You have put many of my favorite foods in one recipe. Thank you. Looks great Kevin! I've bought several whole pineapples this year because they have been so cheap…I'm not sure why?? Thanks for another spectacular recipe! This looks just amazing all the way around – from the fresh pineapple to the cashews – yum! This looks really good I just might try it. All my favorite ingredients in one dish. Yumm! The photo looks good enough to eat right off the web page. I love all of the ingredients you have added in here minus the shrimp. I am just not a seafood person, but I bet this recipe taste delicious with chicken too. I am going to try it. Thanks so much for sharing!!! Pineapples ARE sweet and juicy these days! I just got 3 for $7 at the Superstore!! Yahoo!! Maybe i'll be making this colourful rice of yours, looks delicious! I love the proportions of rice to "filling". What a great combination of flavours…both colourful and yummy! Michelle@Life with Three: I think chicken would work great as well! Beautiful. I eat with eyes and it woke my tastebuds right up. So gorgeous and tasty sounding! I love all the flavors – fresh pineapple is the best! Made this today… added some freshly grated ginger, and it was fabulous. The bonus is now I leftover shrimp and pineapple for grilled kebabs tomorrow! Thanks for all of your recipes. love this fried rice since I;m a rice freak!! what a lovey ingredients in your rice!! what wonderful colours! im drooling! This looks absolutely fabulous, Kevin. Great job! This sounds great and with such simple ingredients. Oh my word! That looks AMAZING. I've been wanting to try pineapple rice for months now! I made this tonight for my dad's birthday and my family LOVED it. Every part of it was delicious. The roasted cashews, pineapple, peas, and everything were awesome. Thank you so much for this recipe! What a unique fried rice! I can't wait to try this! I love pineapple fried rice. I just made this recipe this week. It came out great. This recipe looked so good that I ordered pineapple fried rice at my local Thai restaurant. I was terribly disappointed, which motivated me to try this recipe. It looked just like the picture and tasted awesome! Thank you Kevin! It's getting out of control how much I like this recipe. I am going to make it again tonight! Thank you so much for posting these marvelous recipes. Wow, your recipes and photos are great! You are prolific, too! Here is my take on Pineapple Rice, as well as links to making a Pineapple Boat or Pineapple Bowl. I have subscribed via RSS so I can get more of your great recipes. Thanks! I stumbled across this recipe this morning and decided to make it for dinner. I subbed tofu for shrimp and omitted the red chile (because I was scared of it). It came out great! Thanks for sharing! I just made this rice this morning. Excellent recipe. Thanks a lot!! Just made this meal last night and it was FANTASTIC!! We accidently forgot the garlic (oops!) and didn't care for the cilantro. We couldn't find a red chili so we used one green serrano…which provided plenty of heat! Everything else we kept the same. Thanks for such a wonderful recipe. I like the idea of serving this in a hollowed out half-pineapple. I also think you could leave out the shrimp and double the recipe and serve it as a side or take it to a potluck. And for those calorie-counters out there, there are about 440 calories per serving. Se você se interessar por culinária brasileira é um prato cheio. wow! i wanna marry you. lol! seriously that looks fantastic and since i can't have you as a husband who cooks for me, i am going out to buy the ingredients and cook it myself. i LOVE pineapple fried rice. at my favorite restaurant, they serve it with lightly floured deep fried shrimps. yumm. and sprinkled chicken floss. it made my throat super itchy! Then I looked it up online but there are different reasons why it is itchy *frowny face*. This looks so delicious and so you inspired me to cook this dish as well, thank you for this. I just love the combination of savoury food with a sweet and spice taste. I was amazed by all the fabulous recipes that you have on your blog. I will definitely be watching out for more to come. I will be trying this amazing rice dish tonight, but I do warn you, I never follow a recipe to the exact; I always add my own tweaks and changes. I love cooking, and seeing all these wonderful recipes and vibrant colors is making me love it even more! I do have my own website as well, http://www.chantalsrecipes.com/ check it out! Hi Kevin, my name is Maria. I reproduce your recipe on my blog giving the link to here. Let me know if it is fine or not. I always use my name and always give the link to where is the original. Thank you very much for your time and kind consideration. Every time I go looking for a recipe for something I end up back here by accident. Love your site. made this tonight. I omitted peas, cashews, raisans (not a fans), and added fresh ginger. It was nothing short of AMAZING!!! I did add a bit of salt. My husband squeezed fresh lemon onto his and it was really good. I prefer it as is! Just a few suggestions…enjoy!! I made this recipe exactly as written last night. It turned out very very good. I love that there was so much going on in the dish. The sweetness of the pineapple, with the crunch of the cashews and the freshness of the cilantro made this very tasty. I love heat, so I added some Sriracha hot sauce to my dish which took it to a whole new level. Mmmmm. This recipe is in my cook book and will be made again soon. I love this recipe and have made it several times. We don't eat shrimp so I use chicken and put in whatever veggies sound good or that I have on hand. It is soooo yummy!!!! When we adopted our daughter from China last summer I got this in a resturant there and searched for a recipe like it when I got home-this is the best version I have found. Thank you so much for sharing this great recipe! I switched out rice for quinoa and it was pretty fantastic.